Your trip through Laos is almost over. It started in Northern Laos, the mountainous area that borders Thailand, Myanmar, China, and Vietnam. Temples in Luang Prabang. Tubing down the Nam Song River in Vang Vieng. French colonial architecture in the capital of Vientiane. Then you flew to Southern Laos, whose landscape is controlled by the mighty Mekong River. Markets in Pakse. Pretty soon, you’ll head east into Central Vietnam. You have one more stop before Da Nang, though. Unlike the other cities you visited, Champasak isn’t on the well-trodden tourist trail that runs through Laos. If visitors have heard the name, they usually assume you’re talking about the province—Pakse is its capital—with the same name. But the town called Champasak lies 25 miles to the south. It, too, sits along the Mekong. It has French Colonial architecture, crumbling shophouses, and ancient temples, as well. But Champasak isn’t a bustling city. It’s just a quiet, riverfront town. Champasak wasn’t always a sleepy little village. It was once the seat of the Kingdom of Champasak, an independent Lao state. Then the French arrived. They overtook the kingdom, abolished the state, and created Laos. Colonial manors, which were once royal residences, are now decaying. Vat Phou, a Khmer Hindu temple on the outskirts of town, is now in ruins. Champasak feels both haunted and serene at the same time. If you think the center of town feels remote, wait until you arrive at the River Resort on the northeast edge of Champasak. An overgrown path, part of the former royal orchard, meanders from the main road toward the river. You begin to think that you’re getting lost among rice fields and ponds until you spot the top of a building up ahead. It’s a low, two-story garden villa that’s part of the resort. You find riverfront villas, an open-air restaurant, a hidden spa, and two infinity pools as you get closer to the water. Chirping birds are the only things you hear along the way. The River Resort is a rustic-chic resort. Bamboo furniture and Laotian textiles decorate the inside of your riverfront villa. There’s an open-air shower outside. 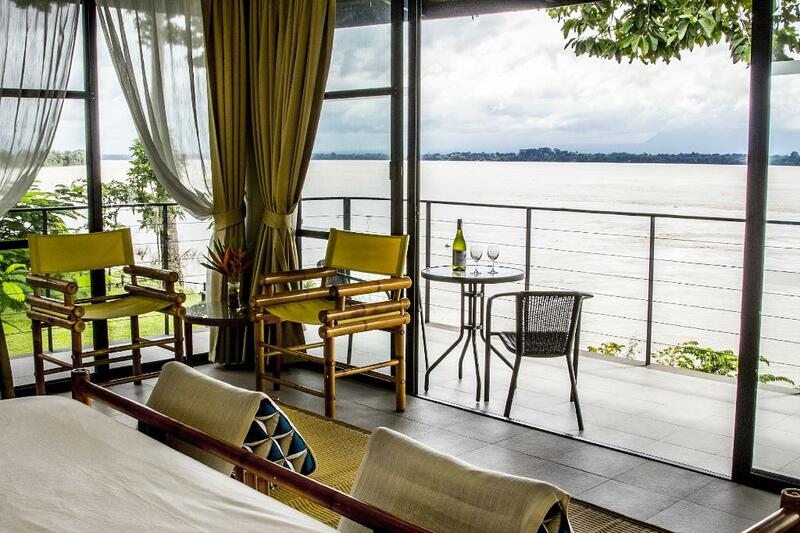 But you only notice the room’s full glass wall overlooking a long terrace and the rushing river. The restaurant and the pools have similar views. You decide that a swim and a Beerlao are the first things on your agenda. Biking into town, cruising the river on a custom-made riverboat, and kayaking to Turtle Island are quickly added to the list. You might even book an oil massage since you’ve been traveling for so long. There’s no rush, though. There isn’t a list of sights that you need to see in Champasak. Being here is more about connecting with nature and meeting local people. It may be your last stop in Laos, but it’s the first place you’ll mention when people ask you about your trip to Southeast Asia.